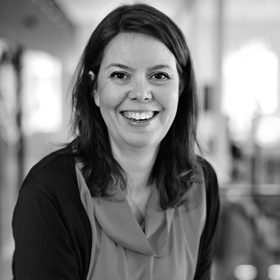 Since 2001 you’ve been CEO at Doberman, a design firm that’s made the top three in the list of Sweden’s top firms for nine years running. How did you come into contact with them? They’d been watching me at Hyper Island. After school I was going to go and work for a traditional firm in New York, but a guy called David Erixon asked if I wanted to help start a new business line at Europolitan. I was going to be employed by Doberman as a business development manager. It was like a dream, I was just 27! You could say that David lifted me up to something I didn’t think I was, because I thought I was a classic project manager. Your first task was writing a business plan for mobile internet. You were were really thrown into it? Yes, and it was old structures and an awful lot of politics which clashed with my way of leading. I’m the kind of person who runs a business because I want to lead change and get things moving when I come in the room. I feel a little like a Trojan horse, even if it sounds a bit strange to describe yourself like that . . . Anyway, after four months I quit the assignment, at which point someone high up at Europolitan rang and said “You know you’ve blown it now, you won’t get another chance like this”. But then I was so full of “I can do what I want anyway, I’ll just move on and do something else”. Later, when Doberman was going to set up an office in Stockholm, David wanted me to do it. 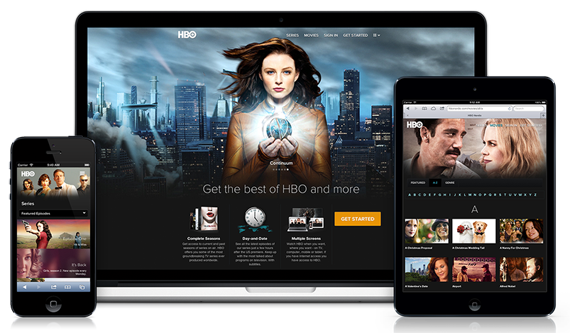 HBO Nordic, video on-demand service. Digital identity, web and mobile services, 2012. What was your vision with Doberman? We wanted to be Scandinavia’s best firm for digital identity, a category that’s obvious today but didn’t exist then. We wanted to feel good and to make a profit – because our business wasn’t known for that. Either you made a profit and did amazing things and slept in the office. Or you did good things, felt good, but had no money. We wanted to do everything. Today, we still work from these three parameters: quality, well-being, and profitability, where all three are equally important. In 2007, Alecta selected you as Sweden’s best workplace. You work very closely together? Because the people here are very talented, we think we need to make the most of their talent by running the business together. So we have to constantly invent new models for it. We have an extreme form of participation where all the employees are involved in decisions connected to, for example, budget, recruitment, or which clients we’ll have. For example, we stand and vote on things. It’s not an easy model but it’s the only one I believe in, collaboration is superior to everything. But being involved and deciding isn’t just cutesy, you also shoulder responsibility. 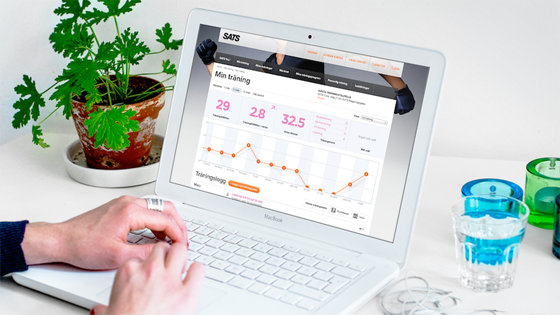 SATS, health and fitness site, 2012. It’s interesting to talk about design as a business matter. What’s your view? Design is understanding people’s needs and translating it into something comprehensible. I think it’s become more and more a business matter for all kinds of businesses because the market’s expectations have increased. By understanding the customer’s expectations, we can shape business strategies with tools like storytelling and through conceptually developing future products and services. Design as a business development method has just started. When you embark on a major transformative journey, you have to be sensitive and begin with a small, concrete improvement for the customer. Then it’s easier to get support for the subsequent major strategic work. SVT Play, TV on-demand. Brand, web and mobile services, 2009– ongoing. You’ve opened an office in New York. How do you keep your culture when you get exported? I believe in some form of common core values, approach, attitude, and offers but with quite a strong local flavor in how people choose to execute it. It’s a dialect, but the same native language. Have you had any mentors or role models who’ve inspired you? I often get this question and unfortunately the answer is no. But I will say that my network of female entrepreneurs are as close to mentors as you can get. When we meet, we talk business development, modern leadership, and “how we move the industry forward”. When I receive requests to lecture, sit on boards, and other exciting offers, I always tip off about three other women when I have to say no myself. I’m confident that my closest hundred female entrepreneurs will have made a big impression on society within ten years. There is a stronger “we”; I don’t feel alone. 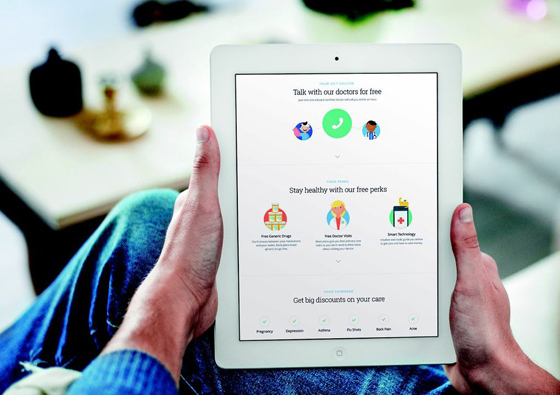 Oscar, New York based health care service. Design technology, interaction- and visual design, 2014. Did you used to feel alone? Yes, I did. As CEO, you can only show your vulnerability up to a certain point, the same with getting or desiring approval from your own organization; you can need to be on the outside to get it. Then I have a kind of inner drive that I don’t really know where it comes from. If I don’t get approval from outside, I give it to myself. After a bad day, in the car on the way home I think “Good Lisa, that was still . . . however things are, it was still really good”. People often talk about how women should be confident and help themselves, but don’t people get really provoked if they do? My perception is that it’s very provocative, and that’s hurt me. The most common feedback I get is “Can’t you just back off a little?” Although not in the US: they love it there. 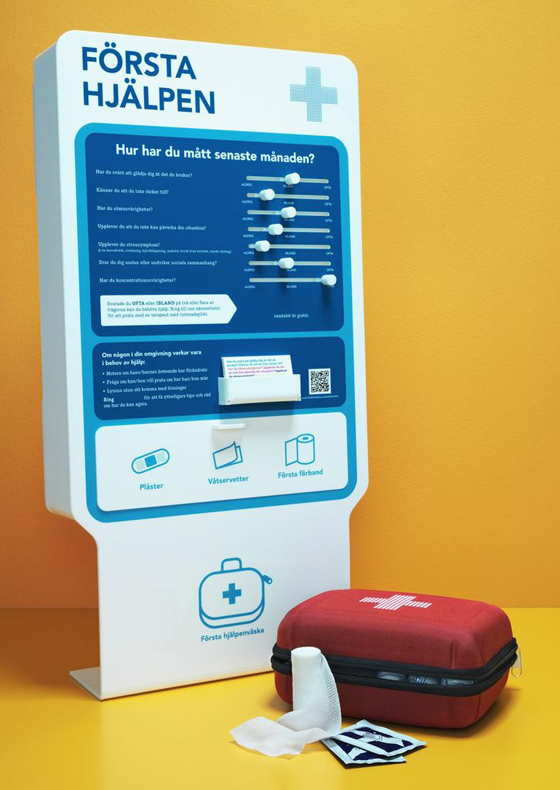 Första hjälpen/Mental Health First Aid Kit, 2013.